For Charlie Bucket, life isn’t very easy. He and his mother and father live in a very small house with Charlie’s four grandparents who all share one bed between them. There isn’t much to eat besides cabbage soup and not even very much of that. What Charlie really longs for, is chocolate and not just any chocolate but Willy Wonka’s chocolate, made in the chocolate factory Charlie can almost see from his house. Mr Wonka is a mystery, a conundrum, one day he was there and the next day he suddenly vanished and nobody has been into his factory or cast eyes upon him ever since. Now Mr Wonka has offered five lucky children the chance to step inside the factory, five Golden Tickets hidden inside five bars of chocolate. All Charlie needs is one tiny, near-impossible stroke of luck. 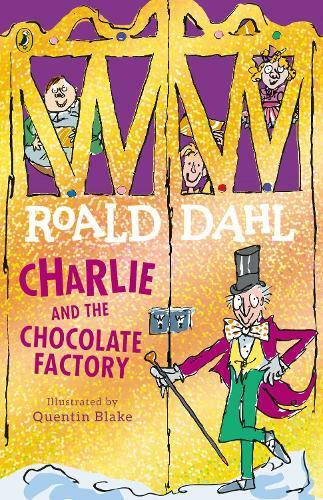 Waterstones gives you a golden ticket to step inside the magical world of Willy Wonka. Join gum-chewing Violet Beauregarde, television obsessed Mike Teavee, greedy Augustus Gloop, spoiled Veruca Salt and Charlie himself of course as they sample the delights of the chocolate-maker’s world. Wonders await you on the Wonka tour; chocolate fountains, Oompa Loompas, lickable wallpaper and much, much more. Now the magic of Roald Dahl is brought to life in these new illustrated paperback editions from the imagination of Quentin Blake, Roald Dahl’s own favourite illustrator. With brand new, bold cover designs and Blake’s quintessential pen and ink drawings these are classic editions for every generation to enjoy. One of Britain’s finest living illustrators, Quentin Blake has put pictures to more than three hundred books and was Roald Dahl’s favourite illustrator. As an author he has written and illustrated a number of bestselling children’s books including The Green Ship and Angelica Sprocket’s Pockets. In 1999 he became the first ever Children’s Laureate and in 2013 he was knighted for services to illustration. The world’s number one storyteller, Roald Dahl was a prolific writer, creating some of the most well-known and well-loved characters in English literature, including the BFG, Willy Wonka and the Enormous Crocodile. Roald Dahl was also man of many faces - top children's author, sometime screenwriter (including, famously, the screenplay the James Bond spectacular You Only Live Twice) and a master of genre-defining 'twist in the tale' short-stories, a format he honed to glittering effect in a number of anthologies including the darkly memorable Kiss, Kiss. From his iconic illustrations of The BFG and Matilda to Mr Stink with birds and beasts of all shapes and sizes along the way, Roald Dahl’s favourite illustrator Quentin Blake has been making us smile for more than half a century. This book is a classic, it is really good and will make your imagination go wild. It is one I would read again. I recommend to all kids aged 5-12.